What paperwork do I need to live and work in the Virgin Islands? If you are an American citizen, you need NO EXTRA paperwork to visit, live in or work in the US Virgin Islands! 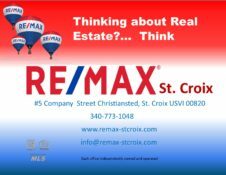 Is St. Croix suitable for retirement? Is it suitable for seasonal or permanent living?YES! St. Croix is a popular place to retire and many people of all ages seasonally visit the island. Permanently moving to or retiring on the island is an option as well, however, we recommend you fully research the island lifestyle and weather patterns to confirm they match your year round desires. What about my pets? Can I bring them too?! Of course! There is no quarantine for animals coming from the mainland to the US Virgin Islands. Your pet will need to go through a vet exam and get a health certificate before coming over and if you have “exotic” pets like birds or reptiles, you may need to get an import permit. You’ll also want to check with airline service providers to confirm transportation for your pet. We recommend doing thorough research on this top. Here’s a good place to start. Will my cell phone work on St. Croix? How much does it cost to call the mainland from a land line? Some cell phone providers have coverage on the island and calls between the island and the mainland may be covered in your national coverage plan. It’s best to call your provider and check. Land line calls between the island and the mainland tend to be between 10 and 25 cents a minute. Airfreight may also be an option for you depending on how quickly you need your items delivered, how much you have and what costs you’re willing to cover. What other things should I know about life on the island? Benefits of island living; we enjoy a fairly constant climate and temperature in the high 70’s and mid 80 range. There are no severe rainstorms and no snow. The landscape in the islands is beautiful and can be enjoyed year round. Water activities are world-renowned. There is no sales tax or state tax. It is the Caribbean but when in the U.S.V.I you are in a United States territory, so you enjoy all protective laws of the United States including the legal system. The island lifestyle is laid back.